In last week’s edition of eHay Weekly, I discussed the dual opinions invoked by reed canarygrass. This week, let’s take a look at another grass that garners mixed opinions: johnsongrass. My first experience with johnsongrass was in the late 1970s while working on a farm in southern Illinois. The species was starting to take hold in the area. Anytime we saw a patch of johnsongrass, be it field or road ditch, it got spot-sprayed with glyphosate in relatively short order. This action was driven by the horror stories of others who had chosen to let this warm-season, rhizomatous grass have its way. Like reed canarygrass, johnsongrass has made its way onto many states’ noxious weeds’ list. It is extremely competitive and can quickly overtake a field or pasture if left to its own devices. These days, many livestock producers choose to keep johnsongrass populations to tolerable levels rather than eliminate the species, which has become difficult to impossible. Johnsongrass has some desirable forage characteristics. In grazing and palatability studies at the Noble Research Institute (Ardmore, Okla.), johnsongrass was shown to be a preferred species by grazing yearling steers. The forage quality of vegetative johnsongrass ranges from 10 to 14 percent crude protein and 55 to 60 percent total digestible nutrients. This competes favorably with other warm-season species such as bermudagrass. Pastures that are continuously grazed often won’t have any johnsongrass because cattle tend to preferably overgraze the species. Johnsongrass is a species that doesn’t tolerate frequent and low grazing because its growing point is 4 to 8 inches above the soil surface. 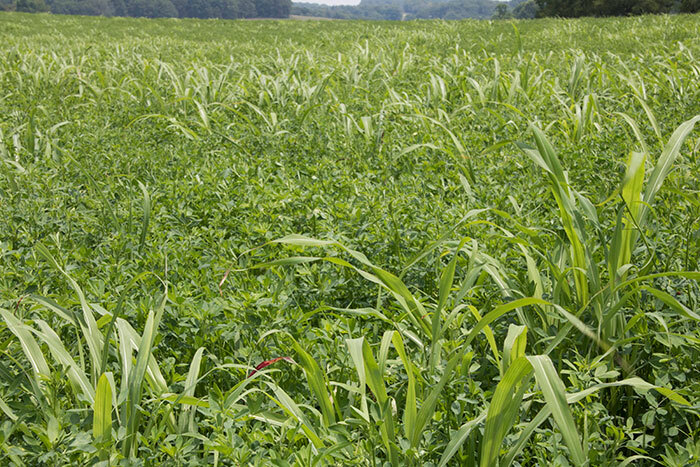 If johnsongrass is to be used as a forage resource in times of short feed supplies such as during drought conditions, it needs to be grazed between 6 and 18 inches. Once the species matures and develops a seedhead, forage quality drops rapidly and cattle will avoid the older tillers. Further, johnsongrass is a prolific seed producer; thoughtful grazing management will keep additional seeds from being added to the soil. Aside from its overly competitive nature, johnsongrass has some other qualities that deserve attention. It is high on the list of prussic acid (hydrogen cyanide) producers under stressful conditions. Dry, cloudy conditions; herbicide exposure; drought; and frost can all induce higher prussic acid levels in plant tissues. Extension specialists warn producers to keep cattle off pastures containing johnsongrass for at least a week following a frost. This becomes even more important with rising densities of the species within the pasture. As plant tissues dry, prussic acid levels will decline to safe levels. Johnsongrass also has the ability to accumulate toxic levels of nitrates. Again, the degree that this might be an issue will depend on the density of the species within the pasture. Given a choice, most livestock producers would prefer not to have to deal with johnsongrass because it’s such a difficult species to keep under control. However, in many cases, that horse has left the barn and keeping the species in check has become the next best alternative. Grazing strategies, pasture renovation, herbicides, and mechanical clipping can all be effective control tools.